» Death Noted: TEDD THOMEY, 1920-2008. Death Noted: TEDD THOMEY, 1920-2008. The passing of author Tedd Thomey was not known to the crime fiction community until quite recently, when Al Hubin came across the news as he was recently putting data together for the online Addenda to his Revised Crime Fiction IV. Mr. Thomey died on December 1st of last year. A tribute to him by Tom Hennessy, a longtime friend, can be found online here, along with several photographs. Storming Iwo Jima: “Tedd landed with the Fifth Marine Division in the Third Wave . He hunkered down in a shell crater. That’s where he was when a bullet pierced his heel and his boot filled with blood. Removed to a hospital ship, he was eating ice cream that night while his buddies tried to establish a foothold on the beach. After the war: “Tedd became a reporter for the San Francisco Chronicle, whose photo staff included [Iwo Jima photographer Joe] Rosenthal. They remained friends until Rosenthal’s death two years ago. 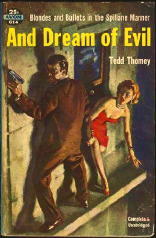 “Tedd also began writing pulp fiction articles, then turned to books, 18 in all, including The Big Love. It was about actor Erroll Flynn’s love affair with 15-year-old Beverly Aadland. Told to Tedd by her mother, Florence, it became a Broadway play starring Tracey Ullman. THOMEY, TEDD. Full name: Harold John Thomey, 1920-2008. [UPDATE] Later the same day. 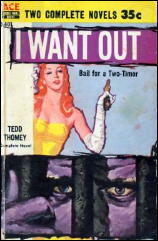 Thanks to Juri Nummelin who points out on his Pulpetti blog another website dedicated to Tedd Thomey’s books, including his non-criminous ones. FLIGHT TO TAKLA-MA was my favorite, a high-testosterone, cold war action story. AND DREAM OF EVIL isn’t quite as good, but what an opening. I’d been wondering lately if Thomey was still alive. Probably few readers have even heard of him. Even though a few of his books were quite good, I think you’re right, Dozy. 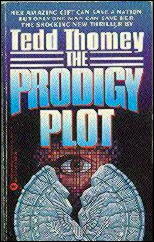 A few enthusiasts like you, I, Juri and some others may remember his crime fiction, but overall Tedd Thomey didn’t make that much of an impression on our little world. He’ll be remembered more for his non-fiction, I’m sure, a body of work that was considerable, but fame is funny. He may be even more well known for his long-running column of restaurant reviews for the Long Beach Independent and Press-Telegram mentioned in that obituary I found for him online. In any case, belated condolences to the many friends and family members he left behind. I had no idea that Tedd had passed away until just a moment ago, when I searched his name on Google. I met him and his lovely wife, Pat, on a trip to Turkey in 1995. We corresponded regularly for some time thereafter. He sent me a personalized autographed paperback copy of “The Big Love.” We lost contact several years ago. He was a very versatile writer who never quite received the recognition he deserved. My condolences to his lovely Pat. Respectfully, Shane Usary. I encountered a couple of brief quotes from I Want Out in Bill Pronzini’s Son of Gun in Cheek. I bought a used copy of the Ace Double paperback with Thomey’s book in it and found it to be quite readable, although short. Unlike some of the books that Pronzini lampoons, the book as a whole is quite a nice read. I just tried to contact Tedd Thomey since on Iwo Jima he served with Marine Corps hero, Capt. Aaron Gove Wilkins, about whose life I am researching. So sad that we are losing these American warriors.